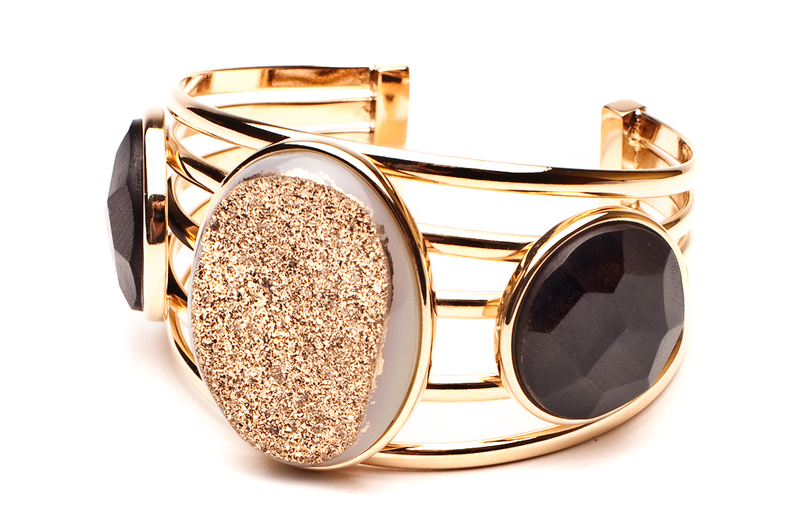 Today is about sharing my current jewelry addiction...DRUSY. 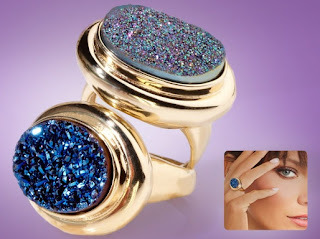 Drusy is a gemstone that has come to the forefront of the jewelry world within the last couple of years. 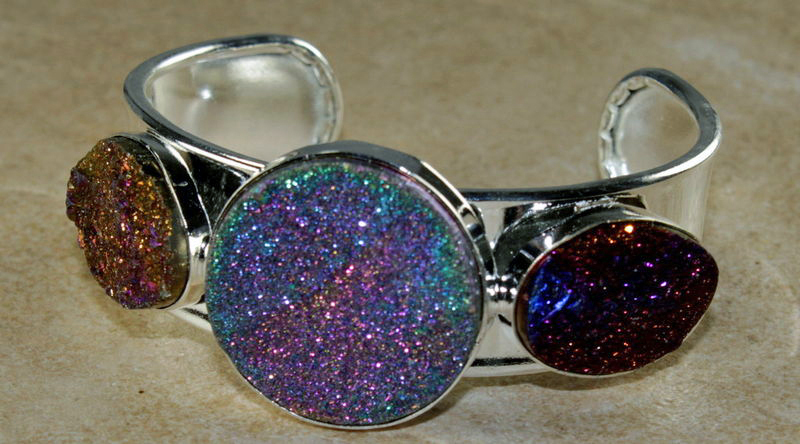 In its' true form, however, it has been in existence for millions of years. 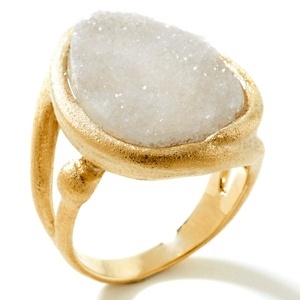 Drusy (sometimes called druzy or druse) is a coating of fine crystals with a reflective surface reminiscent of sugar that forms on a rock surface or is recessed in a crevice of a rock (often quartz). 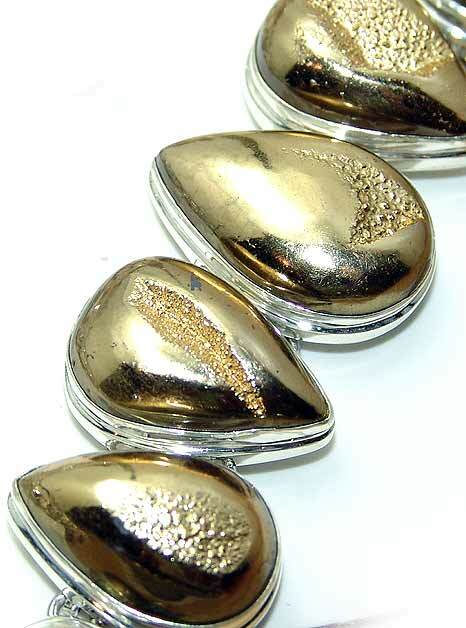 One-of-a-kind jewelry is created from these formations. 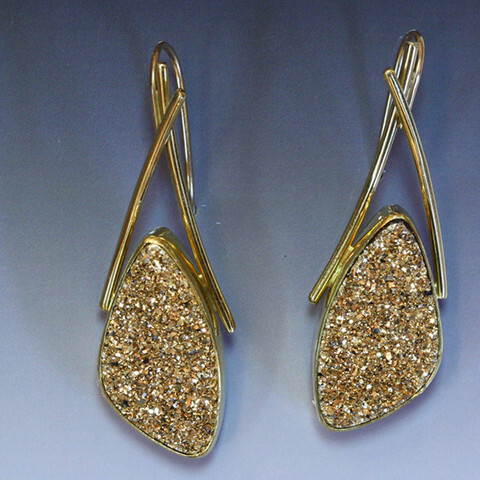 For me, each piece of drusy jewelry is an expression of individual artistry. There is a raw, natural, artistic "rocklike" appeal to every drusy jewelry piece. Most natural drusy falls into the neutral color category: white, gray, tan, or cream. 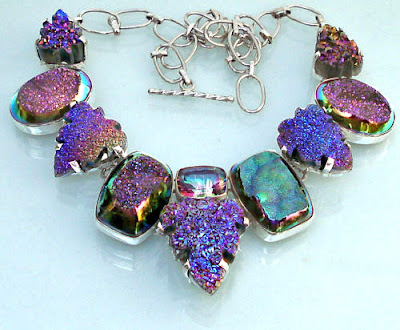 In order to achieve the beautiful, vibrant colors often seen in drusy jewelry, the stones are typically dyed or color enhanced through vapor deposition. This process deposits a colored metallic coating on the drusy. 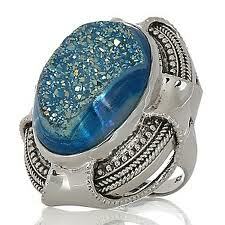 In my opinion, natural or color enhanced, the beauty is mesmerizing! 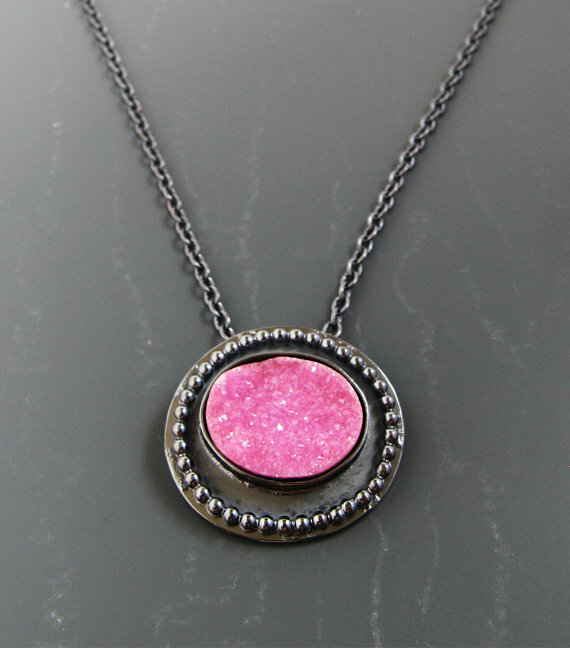 When drusy is set into jewelry, the settings fall into the two categories of flat and window. 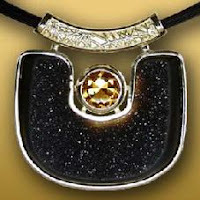 Flat is as it sounds...the top surface of the stone is flush with the setting. The drusy pictured above falls into that category. 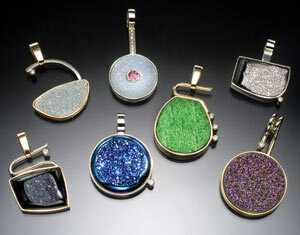 Below are a couple examples of window drusy. Can you see the difference? 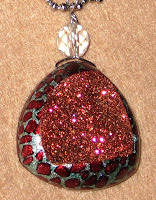 A window drusy is a coated drusy with a clear spot through which the interior can be viewed. Which do you prefer? 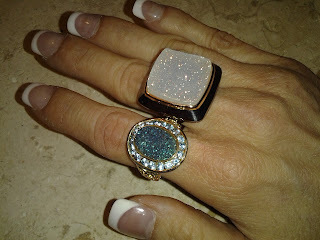 In my opinion, there is a place for both in a jewelry collection, and both have beautiful attributes. Quality and value: You might expect such a bold, fascinating piece of drusy jewelry to be somewhat expensive. 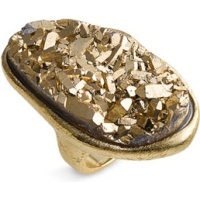 Fortunately, drusy is relatively affordable. 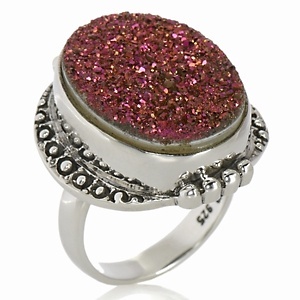 You can get the so called "bang-for-your buck" with this gemstone! Here you are seeing images in a range of colors, styles, and prices. I have included several luxury retailers here as well as the more affordable, but still quality, shopping channel retailers (QVC being my favorite). Another affordable source worth investigating for drusy jewelry is etsy.com. 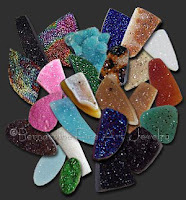 When it comes to quality, the most important factors are color, size and quality of crystals, evenness of crystal coverage, and craftsmanship. 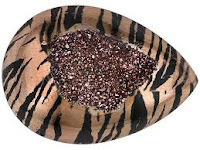 It is important to know that drusy is also relatively durable (a "7" on the hardness scale). 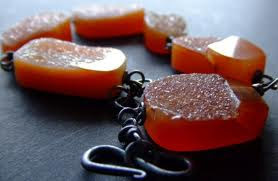 As far as cleaning, warm soapy water is the preferred method. 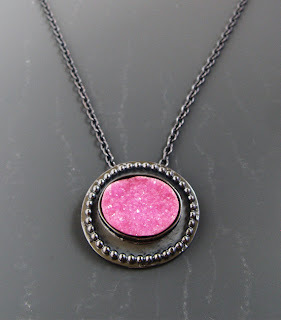 And finally, a few last beauties...Enjoy!!! 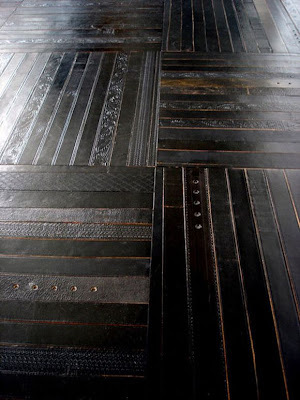 I recently came across a relatively new flooring concept that I wanted to share. 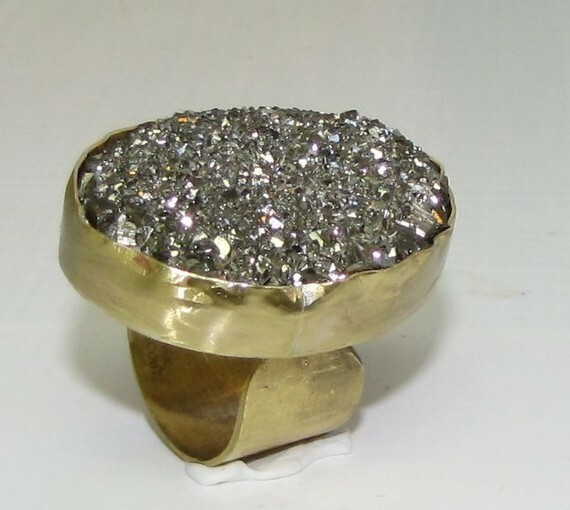 It combines my two loves...Fashion and Design. 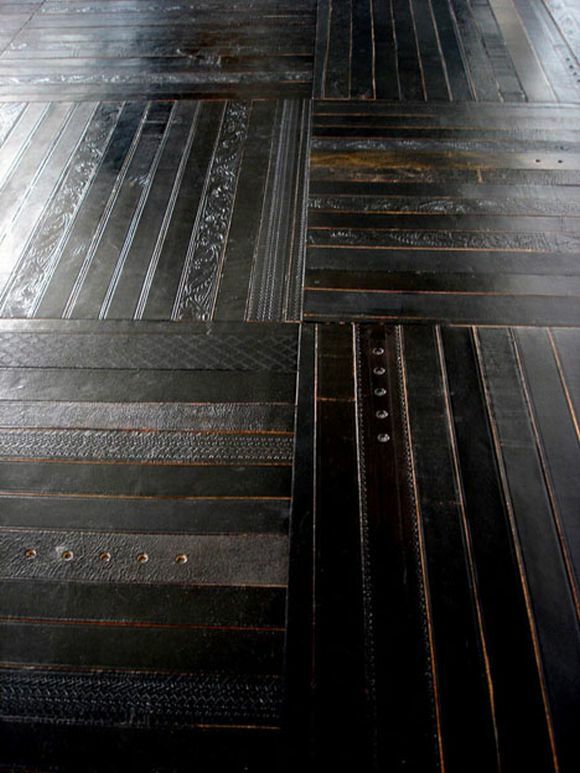 Designer Inghua Ting has created exclusive floor tile designs using recycled vintage leather belts. 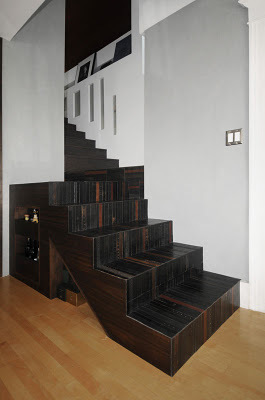 Ting, a Royal College of Art educated designer, who worked in Japan and is now located in London, took her interest in sustainability and used it toward creating a new product utilizing old materials. 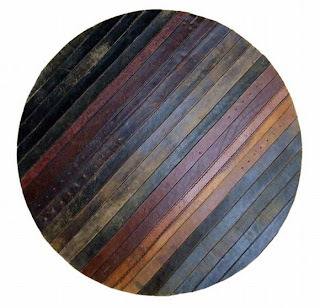 Each belt is hand selected to ensure a high grade of leather, and then the belts are stripped of their metals, hand cleaned with chemical free substances and prepared for use. 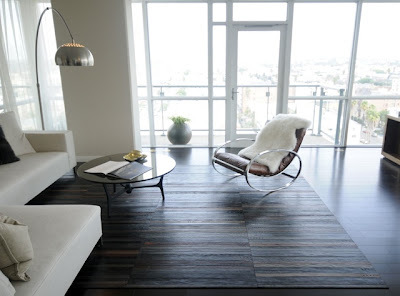 Modular flooring is available in 12"x12" or 18"x18" tile sizes to create a unique, glossy, "hardwood flooring look". As for the question of durability...In a recent article written by Wendy Cole of the Chicago Tribune, Ting assured readers that the durability is "pretty much the same (as wood flooring), because as time passes and feet pass over the leather, it develops its own patina". In addition to flooring, the leather belt designs are suitable for a variety of other uses, including rugs, wall surfaces, tables, and bar tops.